It’s ironic that the a climb as storied as the Puy de Dome has such a short history of inclusion in the Tour de France. Included originally in 1952 at the suggestion of a rider it has not featured since 1988 and despite the wishes of Tour Director Christian Prudhomme is unlikely to do so again. 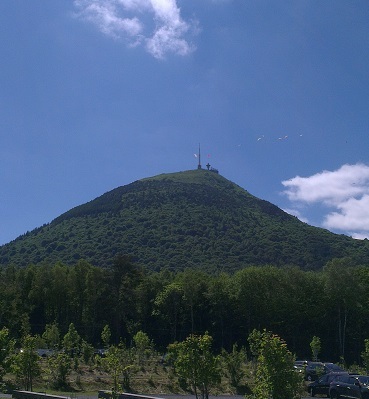 The climb is one of several extinct volcanoes (Puy’s) that characterise the Auvergne region and dominates the skyline to the west of the city of Clermont Ferrand. The volcanoes are long since extinct, none have erupted for more than 10,000 years. That the Tour first visited in 1952 was thanks to Clermont native and professional Raphael Geminani. Born in Clermont to Italian immigrant parents, his father owned a bike shop in the city and Geminani was grew up in the shadow of his supposedly more talented brother Angelo. It was the younger brother who had the impact on the Tour however winning seven stages between 1949 and 1955, although it’s arguable that his strongest results came in the Giro. Unlike the Col’s of the Tour the Puy de Dome couldn’t be included as anything other than a summit finish. The road leading to the radio mast at 1,415m (4,710′) has nowhere to go. Whichever direction was chosen to approach the Puy the final 11 kilometres spiraled around its sides like the markings on a snail’s shell. This road with no more than two cars width would be thronged with spectators up to the summit which had been home to a Roman temple dedicated to Mercury thousands of years earlier. Controversially, outside of the Tour, cyclists could be described as less than welcome at the Puy de Dome. Although cars were able to make the climb without too many restrictions, riders were limited to two days per week and two hours per day as recently as 2006. 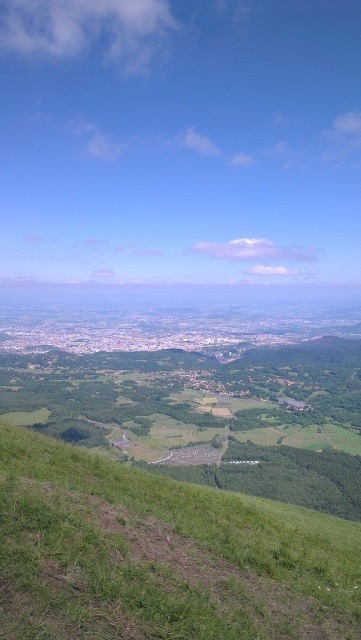 Since 2011 the default mode of transport up the Puy de Dome has been via a funicular tramway that was built with funding from local government and the EU. The Panorama de Dome began carrying passengers in 2012 after some initial mechanical teething problems and follows the original roads route to a redeveloped summit area with restaurant and bar. The road has been resurfaced but is suitable for one way traffic only, now that the railway has taken up half of the available space on the climb. The punishing ramps remain with nothing below 10% in the final 5k and an average of nearly 9%. Certainly approaching the Puy de Dome from the direction of Clermont it’s hard not to feel intimidated at the prospect of the climb. As a summit finish it perhaps ranks with Mont Ventoux as there is nothing remotely like it within the Region. Riders gazing up at the Puy following 200km in the saddle already would have been forgiven for questioning just how they could be expected to race up the mighty Dome. Having persuaded the Tour to visit his home town climb in 1952, Geminani of course wanted to win that years third summit finish. He got into a break with 100km to go with Gino Bartali but they had been joined by the great Fausto Coppi at the base of the climb. Coppi looked at Geminani, decided that he probably didn’t have the legs and il campionissimo won the first race to the top of the Puy de Dome. Arguably the most dramatic finish came in 1964. Jacques Anquetil, already a four-time winner of the Tour, was leading the race by less than a minute to Raymond Poulidor. Anquetil had put time into Poulidor on the previous stage’s time trial, long seen as his strongest discipline and recognised by his nickname as ‘Monsieur Chrono’. He and Poulidor where among a group of five as they approached the Puy de Dome, the penultimate stage. What happened next could only have been more dramatic if the two riders had been racing for the lead, but Anquetil ironically riding for Raphael Geminani and Poulidor were disputing third place. For 9 of the 11 kilometres of the climb Anquetil kept a wheels length ahead of Poulidor as they rode side by side up the spiral. Then, with less than 2km left to ride Poulidor got ahead. Anquetil countered, but Poulidor nosed ahead again. Suddenly the gap was more than one bike length. Then it was two; Anquetil had cracked! At the finish Anquetil had dropped another place to 5th, but although Poulidor was the victor on the road, Anquetil maintained enough of a gap to win his fifth and final Tour. Poulidor continued to race well into the 1970’s his career overlapping that of the greatest cyclist Eddy Merckx. Like Poulidor before him, Merckx would be left with bittersweet memories of climbing the extinct volcano above Clermont Ferrand. Merckx had won the Tour in 1974 in less than perfect health and came into the ’75 Tour in the rainbow stripes of the world champion and wins in the classics under his belt. Merckx was in the yellow jersey when the race reached the Puy de Dome, in fact he didn’t lose it until later in the race, but debate still rages over whether what happened on the Dome caused Merckx to lose the race and with it his chance of a sixth Tour victory. The exact circumstances of the ‘punch’ that a spectator threw at Merckx as he rode up the climb have never been properly established. Merckx didn’t stop, although the contact between him and the spectator wearing a pale coloured raincoat is clear on archive footage of the incident. Merckx identified his assailant after the stage, but although the man was arrested he received the most minor of sanctions at the later trial. As organisers considered where to route the 2013 centenary Tour it was inevitable that the most famous climbs like Alpe d’Huez and the Ventoux would find their was into the schedule. The fact that the Puy de Dome was considered for inclusion despite its absence from the race for many years is testament to its status as one of the most iconic in Tour, if not grand tour history.